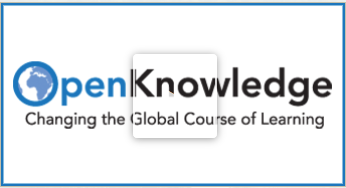 Stanford University (together with its partners) is offering a free OpenKnowledge course entitled,'Open Knowledge Changing the global course of learning'. The free course starts on the 2nd of September to the 12th of December 2014. If you are interested in Open Knowledge, technological change, digital identity, open science, Data and the future of knowledge; you might want to register for this course. Open source, open science, open data, open access, open education, open learning -- this free, online course provides an introduction to the important concept of openness from a variety of perspectives, including education, publishing, librarianship, economics, politics, and more, and asks you to discover what it means to you. Open Knowledge is international and multi-institutional, bringing together instructors and students from Canada, Ghana, Mexico, the United States, and the rest of the world. It will challenge you to take control of your own learning, to determine your own personal learning objectives, to contribute to the development of the curriculum, to reflect on your progress, to learn new digital skills, and to take a leadership role in the virtual classroom. It will also provide you with the opportunity to connect with colleagues from different countries and professions, and to better understand areas where your interests overlap and where unexpected distinctions exist. We hope you’ll consider taking this journey with us. The course is a collaboration between Stanford University School of Medicine, Fordham University, the University of British Columbia, Simon Fraser University, Kwame Nkrumah University of Science and Technology, and Universidad Autónoma del Estado de México.